Whether you’re trying to hit 10 in a row from the free throw line or mastering Poison’s "Talk Dirty To Me" on Guitar Hero – we all need to do a little practice once in a while. With one more sleeve to sew on the other Norah Gaughan knit in the making I have started a pair of Endpaper Mitts. I haven’t done stranded knitting in a while and this is the project I needed to rev me up. I have been experimenting with how to hold the yarn, over or under, with the right hand or left hand… etc. I think by now I’m doing a hybrid of all those different techniques but so far really liking how it’s coming out! Since this photo was taken I’m about up to the thumb gusset. The only thing I didn’t do which I may rip back in the end is the cuff. I used the new to me Italian Cast-on found over on Francesca’s blog with the 2s instead of 0s and it ended up making the cuff way too loose. I plan on finishing it with the 0s and starting the 2nd one properly but I just don’t feel like ripping it out Right Now… I’m just having too much fun fair isle-ing! Happily, things are looking up… I see Feburary on the horizion and what it means… Feb Break. For those lazy mornings (maybe even a stop at the gym… maybe. ), knitting and drinking tea … well we’re almost there. Jan just really was filled with bummer news… I mean Heath now? Wow. Looking good! Stranded knitting is so addictive!!! It took me a while to figure out what “hold” worked best too – I hold one in each hand…. Can’t wait to see all the new and upcoming FO projects! Sounds like you’ve got a lot cooking! your endpaper is looking fab. i love the colors you chose. i’ve never done stranded knitting but i love those mitts and have been thinking of trying them for a bit….maybe. so sad about heath, especially being an accidental od and all. ugh. I still hold it all in one hand, though, it slows me down to try to use two hands. Your tension looks really good on the stranding. Can’t wait to see these finished! Those colors together are so yummy! I found stranded colorwork on DPNs to be fiddly and it took practice, but you’ll find what feels most comfortable to you…and it’s well worth it! I wear mine every day! 🙂 xo-S. I really want to make the End Paper Mittens, too. I just got the transition gloves kit, to do that first, though. Tryig to build up my courage. I’m sure I don’t use an approved method of holding two yarns, either, but I also don’t really mind since it works for me. 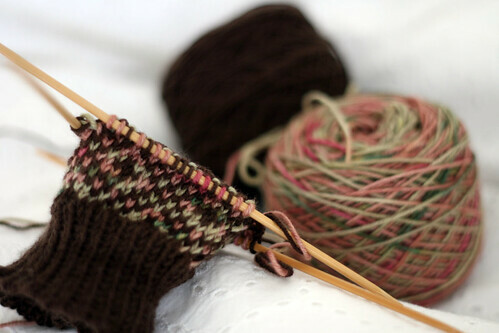 I love the idea of using a varigated yarn for these mitts. Can’t wait to see more! Wow! I love the colors you’re using!! I can’t wait to see how they turn out! I was thinking about making a pair as a “quick knit” – who the hell am I kidding? I love the color choices; the lighter one will make it look all the more color change-y. Sounds silly, but I am thinking of having a Heath movie marathon since “10 Things I Hate About You,” “A Knight’s Tale,” and “Brokeback Mountain” all top my favs list. Such a shame! guitar hero and stranded knitting, 2 of my favorite addictions. your knitting looks beautiful. Good color choice for the mitts. They look really pretty although I am not a mitt person. I hold the yarn in my left hand between different fingers. It works for me so that’s what counts. I tried the different hand/different color method but that was too fiddly. Your color choices are so pretty and that photo is gorgeous! I can’t wait to see it all finished. Love the mitts! I’ve nominated you for a You Make My Day Award! Check the blog for details…. it’s been making the rounds, you have probably already seen it! oh my goodness, those yarns are gorgeous! what are they?